and other oﬃcers from their number. The Group will be expected to submit an Annual Report. oﬃcial notiﬁcation to the Society. Group and these are subject to approval by the Council. British Isles, and are mailed to members’ addresses in the British Isles only. books shall be sent to the Librarian, whose address is in the Membership List. the borrower, the titles and reference numbers of the books wanted. other member has requested the book. necessary. An addressed label for the return will be provided. names and contact details of Branch Secretaries are published in Small Printer. 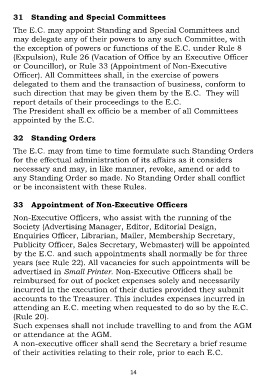 the formation and administration of Branches are given below.